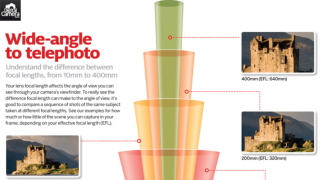 Focal length is one of the most fundamental things anyone starting out in photography needs to get their head around. Many new DSLRs and compact system cameras come with a lens that typically offers a range of focal lengths between 18mm and 55mm. You can fit more of the scene into the frame with a wider focal length (smaller number), so this is a good choice for something like a landscape. A longer focal length, such as 55mm, is better when you want to home in on certain details, be they close to you or at a distance. It's also a more flattering choice for portraiture. All DSLRs and compact system cameras are also compatible with a range of other lenses that offer different focal lengths. If there is only one figure in the title, say 50mm or 90mm, then the lens simply offers one focal length. If the lens has two, such as the 18-55mm lens mentioned above, then you will be able to use these two focal lengths and everything in between. So what actually happens when you change focal length? As the diagram in the cheat sheet below shows, the angle of view changes so that you can accommodate more or less of the scene. This can be measured across the diagonal, vertical or horizontal of the frame, although you don’t need to worry too much about the figures here; knowing the focal length is enough. As a general rule, as the angle of view gets wider (and the number becomes larger), your focal length gets shorter and you can fit more into the frame. So, a lens with a diagonal angle of view of around 110° will correspond with a wide focal length such as 14mm, while a lens with a diagonal angle of view of just 20° will correspond with a much longer focal length like 200mm. It’s important to note that your camera can have an effect on the angle of view you end up with, which itself will determine the effective focal length (EFL) of the combination. If your camera has a sensor that’s smaller than a full-frame sensor, this will reduce your angle of view, which in turn will increase your effective focal length. The majority of cameras under £1000 fit into this category. So, that same 18-55mm lens used on a camera with an APS-C sensor will actually give you an effective focal range closer to 27-82mm.